Mocha desserts are hit or miss around here, but these easy Frosted Chocolate Mocha Cupcakes were a home run! Just a touch of coffee in the cupcakes and frosting intensified the chocolate flavor without screaming coffee. The hubby, unlike his wife and oldest child, does not like coffee nor coffee flavored anything. So I have to be judicious about how I add it to my chocolate desserts. Although the aroma of coffee was obvious when around these mocha cupcakes, the hubby did not balk and ate his fair share! 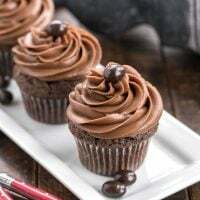 There’s a fine balance between just enough coffee flavor to enhance the chocolate in a dessert and too much where you start to think they are coffee, not chocolate cupcakes! Said oldest child was over for dinner and he was willing to sample and offer his critique. We both could detect a coffee aroma, but not a coffee flavor. That made for an intensified chocolate flavor without any overt evidence that could scare away the coffee avoiders. Welcome to Progressive Eats, our virtual version of a Progressive Dinner Party. Each recipe in our menu this month features coffee in some form: espresso granules, coffee grounds, brewed coffee, coffee extract, etc. Our host this month is Coleen from The Redhead Baker. 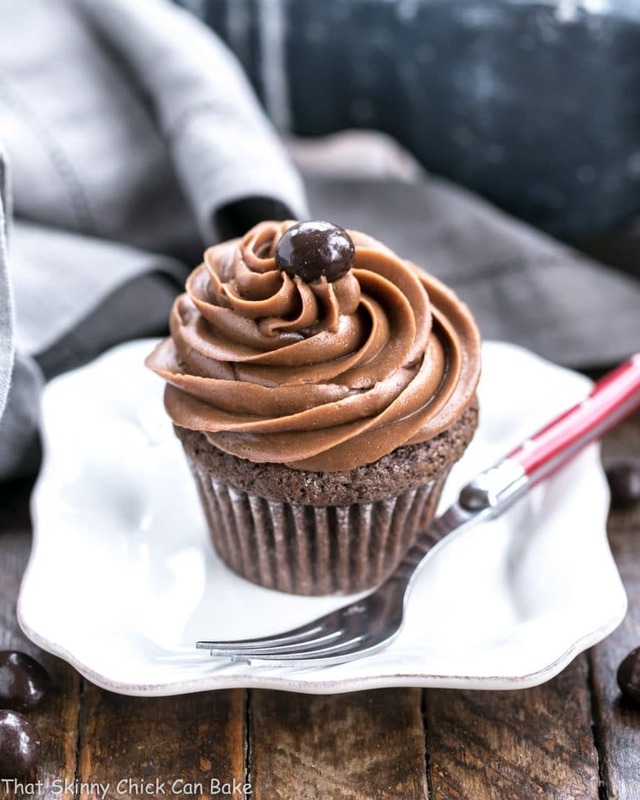 These easy Frosted Chocolate Mocha Cupcakes were a home run! Just a touch of coffee in the cupcakes and frosting intensified the chocolate flavor without screaming coffee. Line a 12-cup muffin tin with paper liners. Set aside. Preheat oven to 350°. 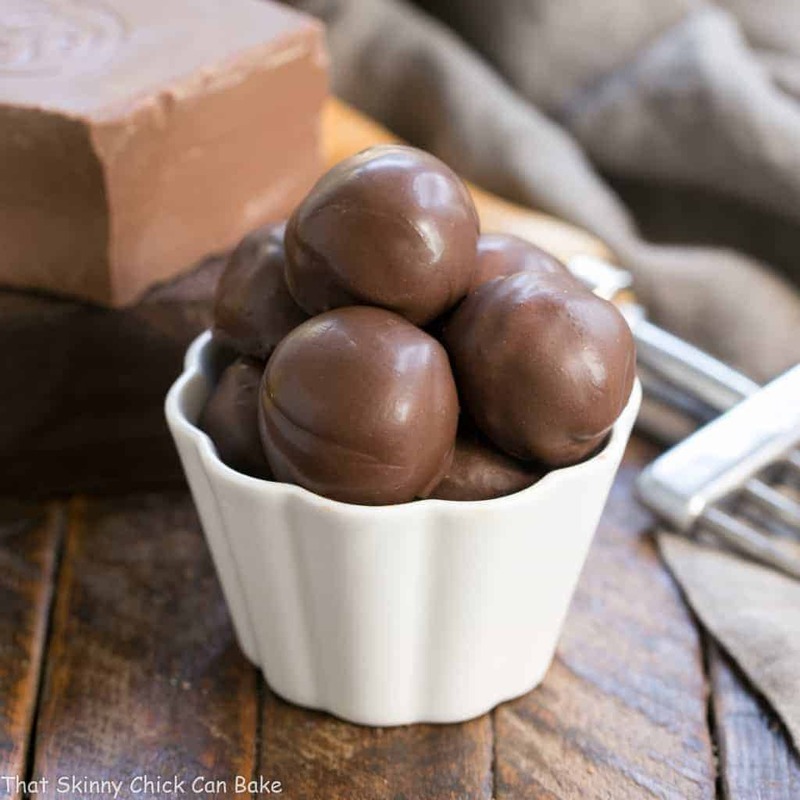 In a small mixing bowl, whisk together the flour, sugar, cocoa, baking soda and salt. Set aside. In a small bowl, whisk the eggs, coffee, oil, vinegar and vanilla. Add to dry ingredients; mix well. Fill paper-lined muffin cups three-fourths full. Bake for 20-25 minutes or until a toothpick inserted into the center of the cupcakes comes out clean. Cool for 10 minutes before removing from pan to a wire rack to cool. Frost when cooled to room temperature. 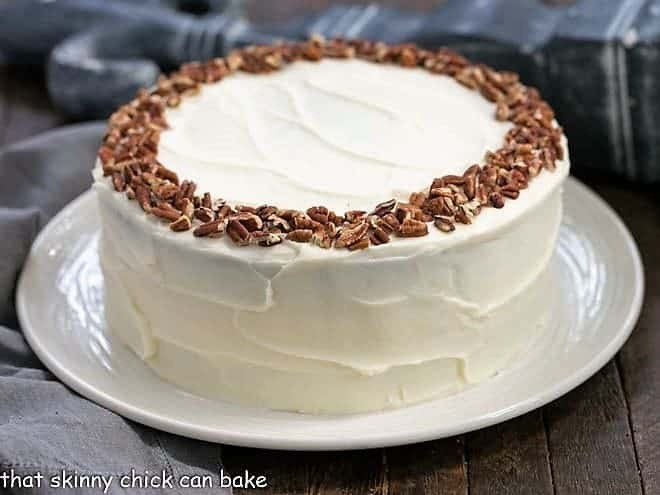 To make frosting, in your stand mixer fit with the paddle attachment, beat the softened butter with the powdered sugar until it is creamy. Add the cocoa powder, vanilla and coffee. Beat for 2 minutes until fluffy. Pipe onto cupcakes. Top each cupcakewith a chocolate covered espresso bean if desired. Love your cupcakes with the beautiful swirls of frosting. Such decadence! Yum, good thing we’re not neighbors. 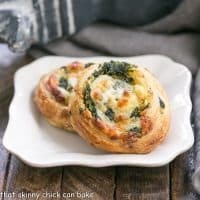 These look so good I might have come knocking on your door, requesting one for breakfast. Beautiful too! I would like a dozen please they look so delicious! I love mocha! These look sinfully decadent with that rich buttercream! They look great and would be gone in a flash here! Just wish I could decorate them as well as you do, Liz! What delicious sounding cupcakes! I’d happily go from house to house to end up with these! But mocha is delicious!! and those cupcakes look wonderful! The swirls are perfect! Love the recipe! That swirl of frosting is just PERFECTION! These sound amazing, and as always, such gorgeous photos! So glad to join in this month!! Not only are these cupcakes absolutely beautiful and mouthwatering, but the light in these shots is gorgeous!! A lovely way to finish our meal Liz!! These sound like the perfect cupcakes. love the mocha! Coffee and chocolate? Heaven together! Really a good combo. These look wonderful — thanks. I know a few of those coffee avoiders (one could go as far as to say, haters). You are fortunate that both of your avoiders did not avoid these beautiful treats. 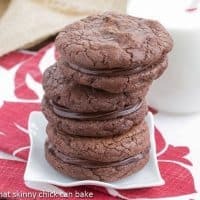 Chocolate and coffee go hand in hand in my books, such a delicious combo (I have been known to add a spoonful of espresso powder to all things chocolate!). Oh Bill *shaking head* lol. 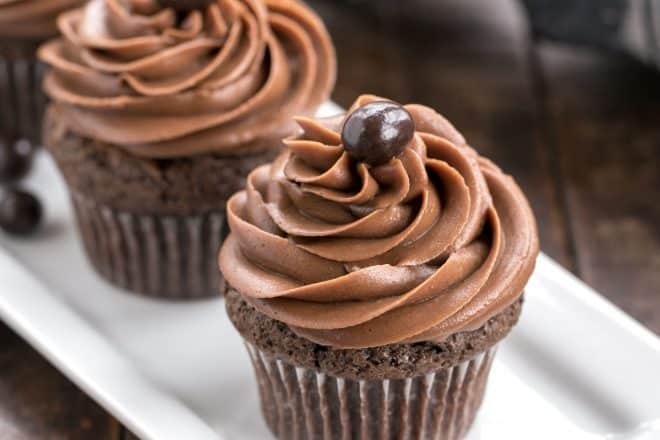 I love mocha flavor and these cupcakes look to die for. Nice frosting skills here. Feel the sudden urge to lick my computer screen. Perfect frosting swirls of mocha and chocolate. 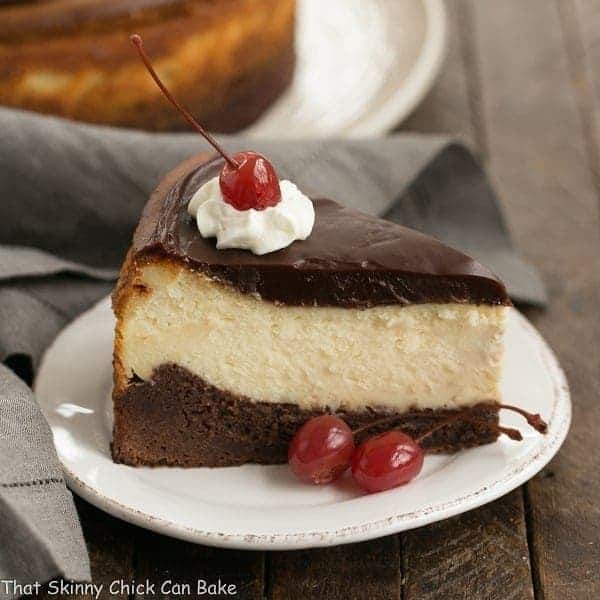 Perfect sweet ending to a progressive dinner… Just pinned. 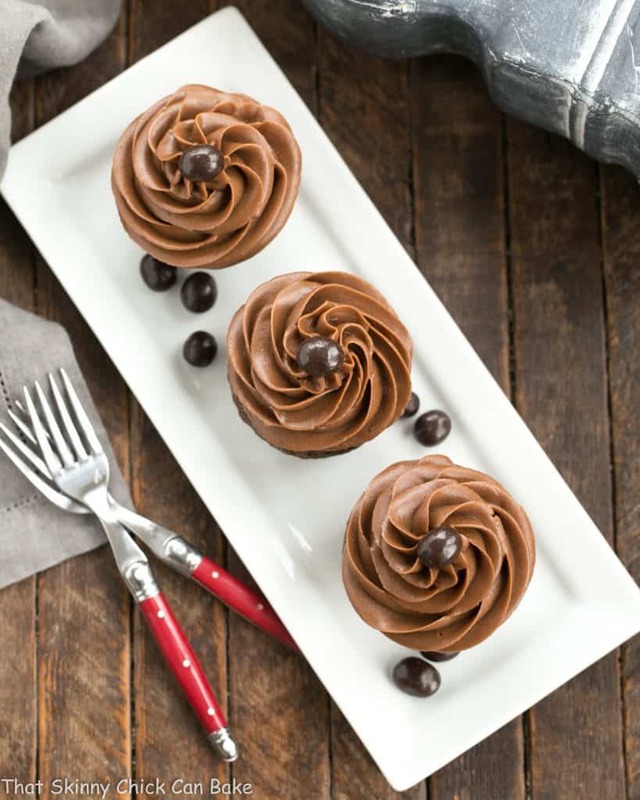 I love that mocha frosting – these cupcakes look simply divine!! That mocha frosting is luscious Liz! 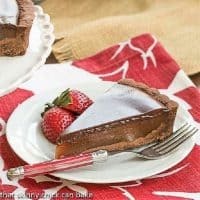 I never get tired of Chocolate and coffee desserts!Thanks for another amazing recipe! Pure Elegant Decadence! Gorgeous photos. These cupcakes look and sound devine, and unlike Bill, I like coffee flavoured desserts. These look SO good! I love the little touch of an espresso bean on top! My goodness, these look delicious. I enjoy cupcakes much more than cake and these ones look so appealing. Great recipe. Man, I love these so much!!! Coffee truly enhances chocolate flavor beautifully!!!! Yum! These look perfect and I don’t think your pictures could be any better. Fantastic photos! I just love Mocha! The very first time my family ever got me to eat any cake at all (hated it growing up!) it was a chocolate cake with mocha frosting and that combo of coffee and chocolate was amazing. These sure do look amazing too. Pinned. You are a woman after my own heart! 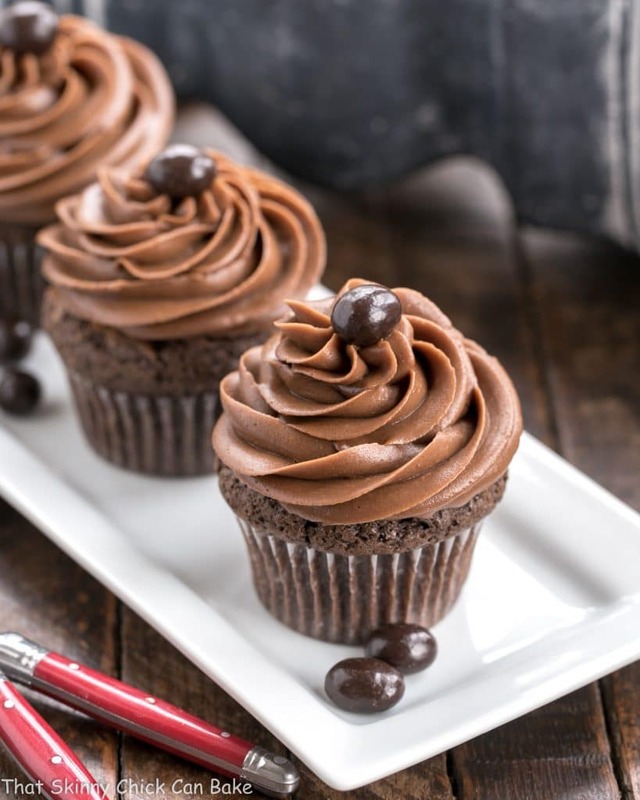 Chocolate and coffee together are such a favorite of mine and I only wish I had one of these delights right now…who needs dinner anyhow; I want a cupcake!